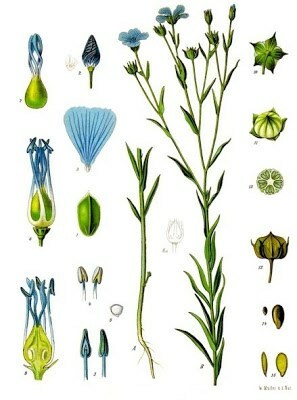 The flax plant. Isn’t the blue colour of the flax flowers beautiful? Yes, it’s that time of the week again. This time I’ll talk about linen which is a wonderful fabric to wear on warm summer days, but it can also turn all wrinkly and baggy. Linen is categorized as a bast fiber since it’s derived from the bast that surrounds the stem of the flax plant. Other bast fibers are hemp, ramie and jute. Flax is probably the the first fiber to be used to make textiles in the Western Hemisphere – the oldest linen findings are around 10 000 years old. Why do linen grow during wear? The flax fiber is actually fairly stable. The reason linen fabric changes is more due to how tightly the yarn is spun and how the fabric is weaved. Tightly woven linen grows less, but the fabric is also stiffer which makes it less suitable for clothes. 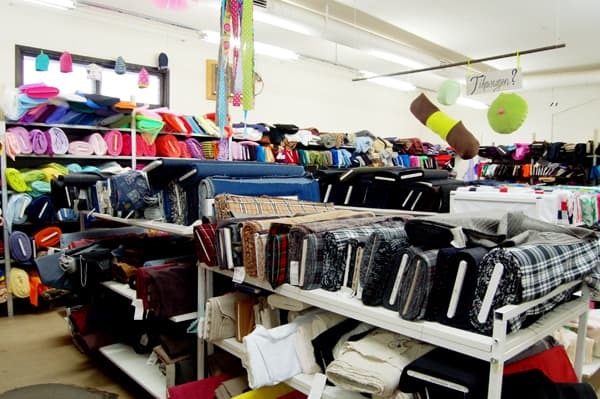 Rayon/linen blends grows more than 100% linen fabrics because rayon has very little elasticity. Should I wash or dry clean linen? The feel and surface of the linen changes after water washing. It becomes softer and gets a slightly nappy surface – the technical term for that is cottonizing. To avoid this slightly fuzzy look don’t put the linen in the dryer and wash at lower temperatures. This fuzziness and wrinkling is the reason why some manufactures suggest that linen should be dry cleaned. But water washing is still a good idea, since repeated washings actually gives the linen a higher luster! Also linen can take a lot of heat during ironing, but repeated hard pressing on creases and pleats might cause the fabric to break. Why do linen wrinkle so much? The reason linen wrinkles easily is that it contains a lot of small rough fibers that easily intertwines with other fibers. This causes the chemical bonds to reform and thus give rise to the wrinkles. All cellulose fibers have this tendency to some degree, but linen a bit more than others. Which linen is the best? Belgian linen is considered to be of the highest quality and linen from Ireland, Scotland and Italy are also held in high regard. But the majority of flax for clothing is produced in Eastern Europe. Linen made of short fiber feels softer, but looses it’s luster faster and wrinkles easier. Most linen fabrics sold today are made of shorter fibers. Why does linen feel cool even in warm weathers? The flax fibers are very long and smooth which makes the fabric lie close to the body which in turns creates a cooling effect – unlike cotton who generally has a much fuzzier surface (flannel and jogging fleece being the most extreme examples). Linen also absorbs moisture quicker than cotton, which also contributes to the cool feeling. This information about linen is very timely – I just bought some online, it is nice quality but extremely stiff, so now I’m in the process of washing it several times to soften it. Thanks for all the fun facts! I did not know any of these things about linen. An apple for the teacher! It is certainly interesting for me to read this article. Thanx for it. I like such themes and anything connected to them. I definitely want to read more on that blog soon.